Found your blog by accident resulting from article in today's NYT re Wm. Clark's daughter's two wills, the great fortune, etc., etc., and they linked to your even more fascinating blog regarding "lost" NYC. Your work is incredibly researched. Thanks, and what fun. Same deal as daveybaby. Loved digging into your blog! Thank you! Brilliant work. Really enjoyed it. Because it was the home of one of the most despicable greed merchants in American history. Yes, I read a bit about his history. Very corrupt man. He just may be burning in the pits of hell right now for all his corruption and greed. Sad. It was sold for 2 reasons. It was too big to be livable. It also cost a small fortune to run, for example a ton of coal a DAY. His daughter from his second, questionable marriage died recently at over 100 years old Hughette (pronounced Hugh-get) Clark. Sad woman, spent most of her life as a hermit even though she had millions. Poor Hughetts (pronounced Hugh-get), the daughter of the questionable marriage. Inherited vast piles of money, lived until over 100, and spent the vast majority of that time as a miserable hermit. Proof that while money buys big houses, it does not buy happiness. Huguette, ( pronounced Ooh-get, was far from miserable. I suggest you read the book EMPTY MANSIONS and learn the true facts. She was very generous with her money and giving gifts to friends, charities, some family members and to others, gave her great pleasure......so, yes her money did buy her happiness. Read "Empty Mansions"....bio of the Clark family. Interesting story, very eccentric family....downloaded from Amazon books. If this structure were a court house or a hotel, or a train station there might have been an excuse for the massiveness- but in my opinion the exterior was ugly primarily because there is just too much of it crammed onto a city lot. The interiors are better, and it seems that some of the paneling and other elements found their way into Hugette's "Beau Chateau". I believe you are correct , Eric. And I've read he promised his his childern by his first wife not to leave the New York Mansion to his second wife, which is why it was broken up, and demolished. I cannot believe this glorious house, the quintessential museum house, couldn't be spared of vandalic destruccion like a time capsule: -The NY Gilded Age Era Museum-; would it have be a big success. Too bad in those times the art's sense from a bygone era and the new century couldn't be compatible anymore. A magnificent mansion indeed with one of the more eccentric owners ever, but the daughters story is equally compelling, if only as an example that great wealth doesn't always make ones life care free. Hugette used her wealth to insulate herself from the prying eyes and wagging tongues of her contemporaries and while she was happy collecting dolls and artwork and also donating generously, it had to be disappointing that she could not lead what we all take for granted, a normal life. 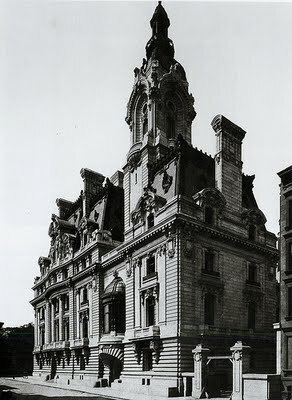 These gilded age palaces unfortunately became white elephants within years of their construction. Rising real estate values, encroaching commercialism, high costs to maintain, requiring armies of servants and changing lifestyles meant the wealthy did not need a burdensome mansion in NYC and instead migrated to luxury apartments. 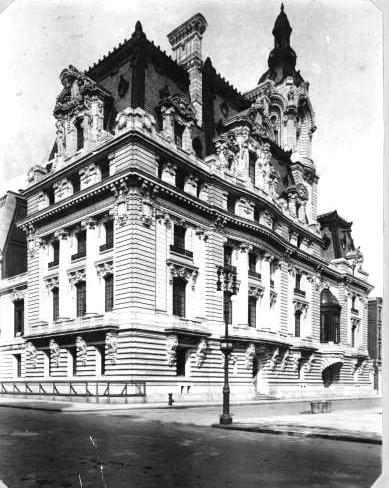 However, what a fantasy it would be to see this beauty on Fifth Ave along with the JJ Astor, Cornelius Vanderbilt II mega-mansion, the William Vanderbilt twin, the Schwab mansion on Riverside Drive, to name but a few. Wonderful post and one I read everyday to discover what treasures are awaiting me today. An exterior hideous enough to match the interior of Trump's apartment. Looks remarkably similar to the City Hall in Paris. Magnificent interior rooms and an equally museum quality art collection made this mansion a true gem. Very tragic that mansions like this and countless others became almost instant white elephants within a few years of their construction. Agree with the posts that long for these structures to still grace our city streets.